Additional 10 users for Nextcloud Business for ClearOS. Additional 100GB storage space for ClearCenter's Remote Server Backup Service app. The Software Updates app provides updates for the underlying operating system components. Availability of updates are dependant on which software repositories are enabled. The DNS Server app provides a localised DNS server for the LAN. DNS provides resolution for mapping IP addresses to easily remembered hostnames (i.e. db1.lan, web1.lan etc.). The Network Time Protocol app synchronizes the server's internal clock with Internet standard time servers. Computers and Internet devices on the LAN can then sync clocks against the local time server, achieving a very high degree of accuracy. The OpenVPN app is a server-side implementation of the OpenVPN protocol. This versatile protocol makes it ideal for either client to server or server to server VPN tunnels using TCP or UDP. Attack Detector scans your system for authentication failures across various types of services installed on your system. If the failure threshold is reached, the app will block the attacking system. This simple, new and disruptive Gateway Management App blocks productivity-sapping content and protects your network from attackers. Time-based Access Control allows an administer to enforce time-of-day web access to users or computers (IP or MAC address) using the web proxy. The Print Server app provides a common print interface to printers on the network. This allows clients on the LAN to share print resources and eases administration into one centralized service. The File Scan app scans the server's file system for infected files. A Flexshare is a flexible and secure collaboration utility which integrates four of the most common methods of accessing files or content - Web, FTP, File sharing (SAMBA) and Email (as attachments). Additional 10 users for Kopano Basic for ClearOS. The Mail Retrieval app can be used to fetch mail from external POP and IMAP servers. This app can be useful if users want a single unified inbox pulling from multiple mail sources (eg. Gmail account, Facebook account, vanity domain etc.). MariaDB is an open-source, Relational Database Management System (RDMS) offering multi-user access to any number of defined databases. Additional 10 users for ownCloud Business for ClearOS. The PHP Engines app allows an administrator to select the PHP version to run inside each web server virtual host. ProxyPass allows the configuration of a reverse proxy. This application can be used for servicing HTTP(S) requests to a background server or host multiple virtual hosts on separate SSL certificates using SNI. The Windows Networking app installs SAMBA - an open source suite of services that allows file and print interoperability between systems running under Microsoft Windows and this server. APC Battery Backup/UPS provides status information, reporting and administrative actions for managing supported APC UPS models. Perform bulk import of users to the system using the Account Import app. Import template supports Comma Separated Values (CVS) that can be created from any spreadsheet application (OpenOffice, Excel etc.). An overview of installed plugins and extensions to the user directory that allows user-based features to be enabled/disabled easily. Account Synchronization provides the necessary tools to manage users, groups, passwords and other account information across distributed slave systems. An Access Control List (ACL) allowing an administrator (root) to grant sub-administrator access to specific configuration pages within webconfig on a per user basis. The Bare Metal Backup/Restore app saves and restores both users' home directories and the configuration settings to and from a USB disk. The dashboard app provides a high-level summary of how your system is configured, how it is performing and what users on doing on the server. Allows you to set the system date, time and timezone settings on the server. Displays information on what ClearOS edition is configured. The groups app allows an administrator to create, delete and modify groups on the system. Groups can be used to efficiently manage permissions in accessing server resources. Let's Encrypt is an open certificate authority that provides free SSL certificates. The app intelligently integrates the certificate lifecyle and management into Webconfig to be used by other services - Webconfig, website hosting, Openfire etc. The mail app provides options for mail notification and simple outbound mail support. Master/Slave Synchronization provides the necessary tools to manage users, groups, passwords and other account information across a distributed infrastucture serving different geographic locations. Control the system daemons and their running state and provides a useful overview. You can also control which services start up at boot time. System registration provides access to the Marketplace containing hundreds of apps to customize your server and receive the latest updates. Creating an account and registering your system is quick and easy. Security certificates are used to secure various apps that you use on a day to day basis. The User Profile app is used to change your password and, depending on your system settings, update other profile settings. The Bandwidth Viewer draws a live graph of your interfaces bandwidth. This can help to determine the maximum speed of your interfaces and identify bandwidth problems across your network. An interactive graph representing filesystem usage. Tabular display of all system log files. Viewing and searching of log files are essential and typically the first step in troubleshooting problems with your server. The Network Report app provides network throughput information on all your network interfaces. Tabular display of all programs (processes) running on the server. Specific information on each process is listed, including process ID (PID), running time, CPU and memory usage and owner. The Resource Report app includes information on load, memory usage and running processes. The System Report app includes information on the operating system and underlying hardware. 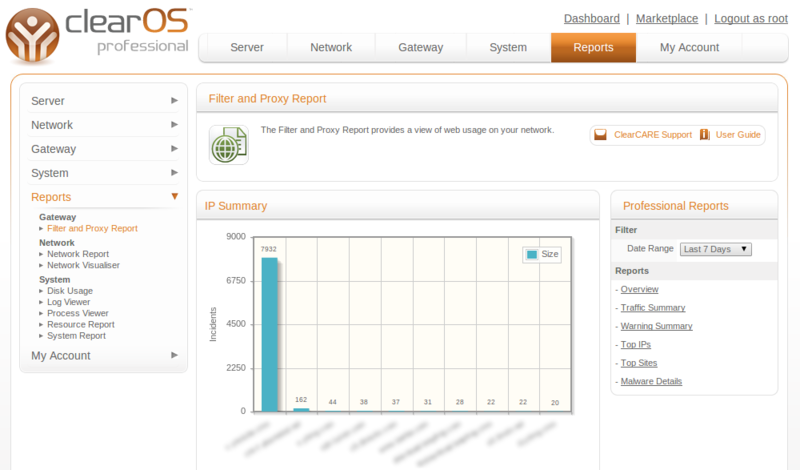 The Filter and Proxy Report provides both a graphical and tabular view of web usage on your network. With the Filter and Proxy Report, administrators can quickly and easily identify inappropriate material being accessed from within the network, workplace inefficiencies, malware sources along with an overall transparency of network traffic. Report data can be filtered by common date ranges like daily, weekly or monthly. 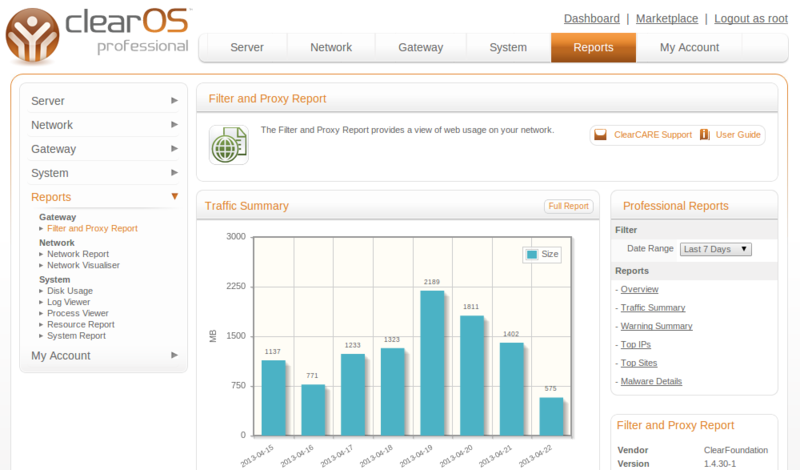 The Filter and Proxy Report add displays historical data only. 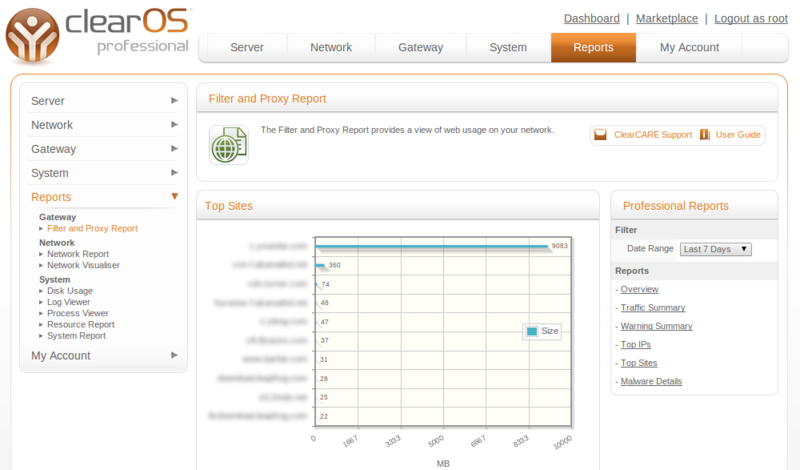 For real-time reporting of proxy traffic, try the Network Visualizer app, also available from the Marketplace. Documentation for this app can be found here. The Antivirus app is designed to help prevent virus attacks against desktop computers, laptops, smartphones etc. by providing a gateway perimeter. The scanner has the ability to filter non-encrypted web traffic and FTP downloads via the browser. The antivirus engine is based on the open-source software called ClamAV. The software automatically updates itself with the latest virus signatures available from the ClamAV community. Additional signatures are available (and highly recommended for any commercial or deployment of 5 or more users) as a subscription from ClearCenter (app-antivirus-updates). The directory server is an implementation (using OpenLDAP) of the Lightweight Directory Access Protocol. The directory contains information on user records, computers, access controls etc. that can be accessed by services running on the server in addition to other systems access the directory remotely across a network.